Do Christians And Muslims Worship The Same God? 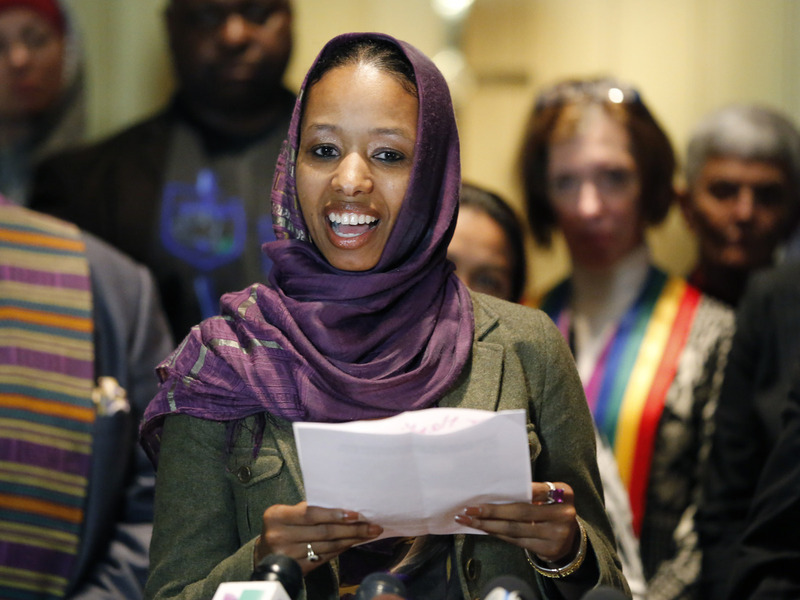 A Wheaton College professor was placed on leave for declaring, in a gesture of solidarity, that Christians and Muslims "worship the same God." But do they? The answer may depend on whom you ask. Larycia Hawkins, a professor at Wheaton College in Illinois, decided to wear a headscarf during the Advent season as a gesture of solidarity with Muslims. In doing so, Hawkins quoted Pope Francis, saying that Christians and Muslims "worship the same God." But some evangelical Christians disagree — and Wheaton, a Christian school, responded by putting the political science professor on paid administrative leave. The college says it needs time to review whether her statement puts her at odds with the faith perspective required of those who work there. Larycia Hawkins, associate professor of political science at Wheaton College. The case also raises some big questions of theology. 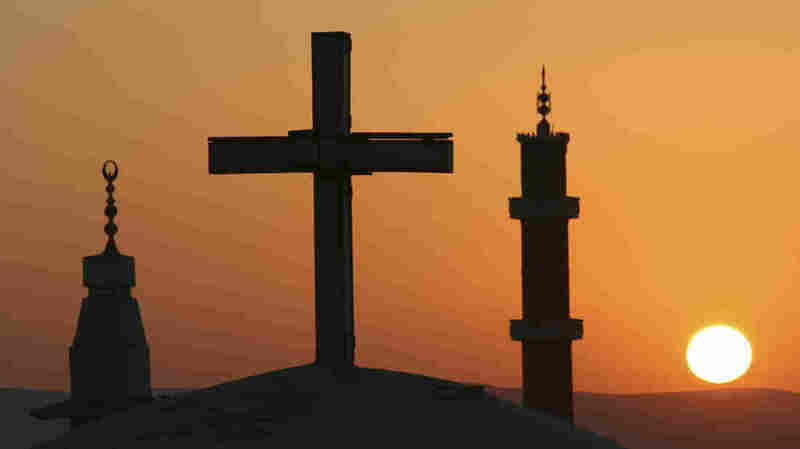 Most mainstream Muslims would generally agree they worship the same God that Christians — or Jews — worship. Zeki Saritoprak, a professor of Islamic studies at John Carroll University in Cleveland, points out that in the Quran there's the Biblical story of Jacob asking his sons whom they'll worship after his death. "Jacob's sons replied, 'We will worship the God of your fathers' — Abraham, Ishmael and Isaac. He is the God," Saritoprak says. "So this God that Jacob worshipped, this God that Abraham, Isaac worshipped, is the same God that Muslims worship today." Christians, however, believe in a triune God: God the father, God the son (Jesus Christ) and the Holy Spirit. And many evangelicals will say that means Muslims and Jews do not worship the same god as Christians. "The question basically comes down to whether one can reject Jesus Christ as the Son and truly know God the Father," says Albert Mohler, president of the Southern Baptist Theological Seminary. "And it's Christ himself who answered that question, most classically in the Gospel of John, and he said that to reject the Son means that one does not know the Father." But Christians themselves differ on this question. The Second Vatican Council, speaking to Catholics back in 1964, affirmed that Muslims "together with us adore the one, merciful God." And Amy Plantinga Pauw, a professor of Christian theology at Louisville Seminary, says Christians can have their own definition of God while still seeing commonality with Muslims and Jews. "To say that we worship the same God is not the same as insisting that we have an agreed and shared understanding of God," Pauw says. One theologian with knowledge of both Christian and Islamic doctrine is Hamza Yusuf, president of Zaytuna College in Berkeley, Calif., the first Muslim liberal arts college in the U.S. Born Mark Hanson, he was raised as a Christian and then converted to Islam. He quotes the Quran as saying that God is immeasurable, so to define God in some particular way is impossible. "God is much greater than anything we can imagine," Yusuf says. "The Muslims have a statement in our theology: Whatever you imagine God to be, God is other than that." At Louisville Seminary, which is affiliated with the Presbyterian Church, Pauw says she's preparing her students for Christian ministries that are likely to involve work with people of other faith traditions, and she says she'd like them to remember that no religious community can claim God's favor. "No one is in a position of saying, 'Well, we know exactly how God works in the world, and my particular group has a monopoly on that,' " Pauw says. She adds: "There are certainly Muslims who will say that. There are certainly Christians who will say that. But it's out of my own Christian conviction that I think we have to approach these issues with a kind of humility and kind of generosity toward others, because God's ways are not our ways." In its statement about Professor Hawkins' view that Muslims and Christians worship the same God, Wheaton College emphasizes its rejection of religious prejudice and its commitment to treat and speak about neighbors with love and respect, as Jesus commanded people to do. But, the statement says, "our compassion must be infused with theological clarity."